Somat is continually seeking ways to improve its sustainability with initiatives that directly impact our business and our environment. To the left are several of the sustainability initiatives the Somat Company put in place in our own facilities. 2010 was a productive year for our sustainability efforts. We conducted an overhaul of our building’s aging and antiquated lighting system. 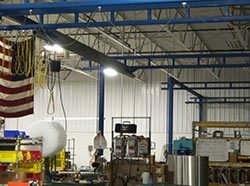 Every light in our shop space and all switches in our offices were converted to motion activated equipment. This improvement eliminated energy waste in spaces that rarely or infrequently required lighting, but were sometimes lighted for long periods unnecessarily. The installation took approximately one business week. All old fixtures, ballasts, bulbs, switches, and wire were recycled locally. Fit, form, and function of the lighting surpassed our expectations. The amount of energy saved was exceptional and the resulting cost-savings were also striking. Green House Gases Removed: 63,953lbs CO2 or the equivalent to 7 acres of trees planted or 5 cars taken off the road. This system has lowered our energy consumption 20%, improved our quality of light, increased lamp life, utilized products that do not require special disposal, and reduced our energy costs by $3,845. A new energy-saving HVAC system was installed in our pre-fab offices on the shop floor. Out-dated, excessive-energy consuming, all-in-one A/C and heat window-units had been in place. These units were controlled by thermostats and ran 24 hours a day. Our new system not only provides more efficient heating and cooling, it also filters air offering employees a cleaner, fresher breathing environment. Installation was completed in one business week. The entire building has been retrofitted with programmable thermostats to efficiently control heating costs. By programming the curve on which the heat will ride, we reduce the CCFO’s of natural gas being consumed, especially on weekends, when the old thermostats would have run the heat continuously and at inappropriately high temperatures. The new system has met all our expectations and requirements. Another goal was to expand our in-house recycling effort. This initiative reduced the amount of recyclable waste entering our trash stream, and cut the amount of waste being hauled away. Since 2010, Somat’s recycling initiative made huge strides in helping us become a better steward our environment and to reduce our environmental footprint. 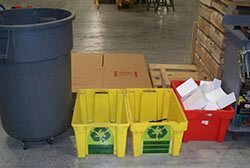 Every office received cardboard recycle totes to recycle paper, plastic, and glass. On an average week we recycle 219lbs of paper, 35lbs of plastic and a minimal amount of glass. Our production area, where significant metal waste is generated, was also targeted for improved recycling. 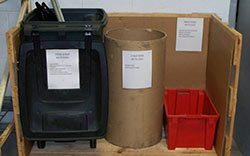 Bins were placed throughout the shop to accept scrap wire, stainless steel scrap, brass fittings, aluminum cans and more. To date, we have collected over 3,900lbs of scrap, all of which is recycled locally. Re-using packaging materials from products we receive to package products we ship out, minimizing the amount of plastics and polymers hauled to landfills. Recycling scrap lumber and skids in co-operation with local merchants who take skids to refinish and re-use in their production facilities. Mulching other scrap lumber and non-usable skids at a local processor. Recycling waste cardboard (an average of 200 lbs weekly) at a local refuse company.